THE COUCH loves sports...not sure that it has been evident here recently. Sure, every once in a while y'all get a blurb about sports, and then it is probably baseball. I am not apologizing for being baseball heavy...of course that is the sport we love the most. SO, today we begin Sports Friday. It will not be a weekly feature, but it will pop up every so often. If y'all don't like sports, THE COUCH certainly understand if y'all don't sit today. There will be a seat available Monday. Vroom Vroom...the Nextel Champ of making left turns, Jimmie Johnson had a bang up off season (didn't he just win the championship two weeks ago?). Seems Jimmie should have been invited to our Clambakes. He is one party animal. TC: Jimmie, thanks for speaking with us today. JJ: My pleasure, hey where is the safety harness on this thing? TC: No Jimmie, no harnesses..anyway how's the wrist? JJ: Wrist is fine..I can drive, I will wear a brace in the car, but no problem. TC: Right...For the uninitiated Jimmie, tell us what happened. TC: OK, well, not sure about the world, so tell our visitors who might live on a tiny desert island in the North Sea. JJ: Well, I was at a charity golf thing in Florida. So the guy driving made a quick turn and I wasn't holding on tight and I fell. I didn't see the caution flag. TC: Must have been a right turn...Ah, JJ...people have said they saw you riding on the roof of the golf cart. JJ: Even you knew that ...sheesh no privacy. OK well yeah I'll tell you, I was Ghost Riding The Whip and I made a slight error in weight distribution. The NY Giants decided that the horrid season they just completed was the fault of the offensive and defensive coordinators and NOT the head coach. Tim Lewis, Defensive Coordinator was let go yesterday after Joh Hufnagel the offensive coordinator was replaced before the final regular season game. Tom Coughlin gets to come back. This guy came in as a drill sargent two years ago. This season his team was a wreck. Penalties, acts of defiance from players, games where they looked like the keystone cops. Perfect example of what happens to a business when the kids finally have control. I hope this is not an example of how the next generation of Mara's and Tisch's are going to run this team. By the way..two years 25-23...nice record Tom. You might have written a nice letter when Wade passed, but it is time for you to move on as a coach. Memphis Tigers are rated 20th in the AP Poll and 19th in the ESPN/USA Today Poll. THE COUCH has to find a way to get tickets to a game soon. LPGA has begun it's new season. Michelle Wie shot a 78 in the first round of the SONY OPEN, 15 shots off the lead. This in her home state of Hawaii. THE COUCH thinks that maybe Michelle might need that schooling she is missing being on the tour at 18. The odds here at THE COUCH is she has a blow-up before the third tournament of the year...any takers? Sidney Crosby is 6 months shy of his 20th birthday. He is a good looking kid who has the world in the palm of his hand. Sidney plays hockey for the Pittsburgh Penguins of the NHL. He leads the league in scoring with 65 goals in 38 games. He has done this while playing in fewer games and averaging less minutes per game then any of the other players who make up the top five in that category. He also leads in All-Star voting. This kid is the real deal. As they say, if he stays healthy he could outdo Gretsky. Yup, held baseball for last. Those of you who have been around a while might remember THE COUCH holding vigil hoping for Barry Bonds to retire. He hasn't but he might end up doing so now. See, it has been reported that good old Barry tested positive for amphetamines during the 2006 season. Yes kids, you heard us...the poster boy for the steroid cloud hanging over baseball tested positive for uppers. Now, in classic Bonds fashion, he immediately said they were not his, but he had gottne them from the locker of a teammate, Mark Sweeney. After Sweeney's agent went ballistic, Balloon-Head-Bonds, backed off and saying Sweeney had nothing to do with the amphetamines. Now, he never denied the report of the positive test. The amazing growing man is in negotiations with the SF Giants for a one-year $16-million contract. The hold up on the signing is language regarding the 'roid-doughboy's following team regulations and what would happen if he was indcted or other legal actions were taken. Maybe this will open Baseball's eyes and the teams will not hire this creatin and force him to go away. David Beckham just inked a deal to get $250-million to play soccer for FIVE YEARS! Not in England...Nope, not in Italy, not in Columbia, not even in Brazil. IN THE USA! The Los Angeles Galaxy of Major League Soccer is going to pay Beckham to play for them. NOTE to owners of the Galaxy...SOCCER ISN'T THAT BIG! I bet he now makes more then your entire team is worth! Finally, say a prayer for Bobby Mercer. He played for the NY Yankees, taking over centerfield for Mickey Mantle. Recently Mercer has been one of the announcers for the Yankees. Bobby, who is 60, had a malignant tumor removed from his brain last week and is recovering in the hospital. If I have not been to visit, I apologize...work has been crazy and time has just gotten away. I will be taking some time this weekend to come by. No, if you read the details of the Beckham deal, he actually is "only" getting paid $50M over 5 years. The remaining money is "potential income" from possible endorsements. "Most of the value is from David's worldwide endorsement," MLS Deputy Commissioner Ivan Gazidis said on Thursday. "That's a separate deal. That's his deal with CAA (Creative Artists Agency) and 19 Entertainment. That's not something we're involved in. "Obviously I think the feeling is that coming to the United States boosts the value of (the Beckham) brand and the revenues that can be generated from it, but that's not our business," he said. "It wasn't part of our contract discussions at all." Oh I love sports, I know not typical for a girl but I like the excitement of the games. I'll never forget the 1986 when the New York Mets clobbered the Boston Red Sox...so nervous there at the end it was tense. make me blood rush and that's why I love sports! Hi - still sick - Syndney Crosby, local boy - woooooo. Later, hon. First of all, what in the heck was Barry doing in Mark's locker ANYWAY??? Geez!!! Have a great weekend, V - hugs!! ugh 1986... a horrible year for a Yankee fan. I prayed there would be an earthquake and the field at Shea would open, all the players sucked down..and they would declare there was no winner for that World Series. COCO: OK, now you and Twyla decide who he is local to, because I know you do not live in Nova Scotia where she does...I learned THAT lesson! PIA: Well ya know Balloon-head is a BIG boy...like that old joke..when your mama sits around the house - she sits AROUND the house...'roids-boy ooozes into all the lockers...Yeah I was disgusted by the Giants too..but I will watch this weekend. TWYLA: With all my Canadian guests, I had to do hockey and Sidney is a hell of a player. Local to the Maritimes, I mean. We're small, you know. I dont get the whole Beckham thing either. I did hear that "only" 50 mil is from salary and the rest is from endorsements, but still, I scratch my head. COCO: Ah ok like saying he is local to me if I live in NY and he was from...say Massachusetts? MATT-MAN: i still bet at $50M he is worth more then an MLS franchise! Hmm, I guess my comment got lost somewhere. I agree with Tisha when she talks about 1986. Whatta special year. I don't know about this whole Beckham deal. If Pele couldn't make soccer popular in the US, I don't think anyone can. Songbird: I don't know where your comment went either. I never got one. DR.B: You know I had a line about Pele and if he could not make it popular no one could... and I thought I included it...when I saw your comment, I went back and looked..and I guess I forgot it... GREAT MINDS BUD! Other than the games LOL well I'm also a woman if you've forgotten and glistening men in tight outfits does it for me! It's true that I much more prefer playing sports (no pun intended) than watching them. Oh damn the 1986 earthquake, that was terrifying, I felt it up in the Bronx and we were all afraid Manhattan was going to sink! Have a fabulous weekend Bond!! I'm not in the sports-know but I'd like to say I enjoyed reading your post. Interesting personalities here! 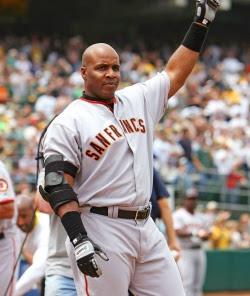 Ummmmmm.... another things... Barry Bonds needs to retire... oh yeah... and that's all I've got to say about that. That´s an "earning" of 4,300 € (four-thousand-three-hundred)EUROs per hour for Becks. No matter if he plays soccer, goes shopping, has a nap, does whatever! I used to go to EVERY game. Of course, I was a student and it was free. Times do change. But... I'm a student again, aren't I? Sweet! Being snarky, Old Soul? It's more like Manhattan to the Bronx. Except a WHOLE lot less crowded ... and cleaner ... and more trees ... but no Bloomies or Lincoln Centre. MIMI: TY appreciate it...but but ..what about UConn basketball? BUD: Thanks! Go away Barry should...I have heard about the money with Beckham.. honestly..I was just about to post last night and the local sports guy came on and reported it and I just added it without checking the details... the horror! Ya, the money Beckham is getting is insane, but it's already having an impact. Toronto just got a club in the same league and they sold 100 season tickets on the day of the announcment. That may only pay his salary for a couple of hours, but it's a start. Some fun information about Beckham's salary, Minimum wage, and the Milwaukee Brewer's payroll.